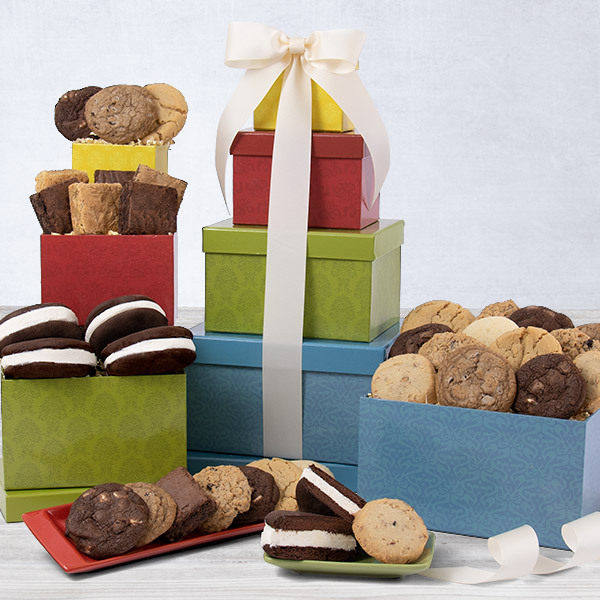 No matter what the occasion is, this “From the Bakery” gift tower will make it sweet! Inside four of our beautifully crafted boxes, we've arranged a decadent selection of our exquisite baked goods. 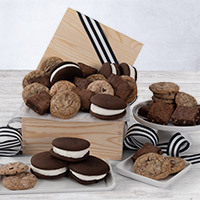 Boasting an assortment of deliciously crisp cookies and gooey brownies, this exquisite display is perfect either as a gift or as dessert for guests! I purchased this for myself and as gifts for others. My family loved the cookies and treats and so did the recipients of the gifts. I bought the gift basket to let family friends/relatives know how sorry we were for a death of a family member. However, I was never told it was successfully delivered. I had no difficulty in ordering this item. It was a gift for my daughter for Sorority Recruitment. She and her roommates loved it and said they would give a 10 out of 10. Bought a cookie tower and had it delivered to my wife at her work. What a great selection of high-quality cookies - everyone raved about them! I received this as a birthday present and it 100% made my day! On time, beautifully wrapped and tasty! Her words. So happy I had the opportunity to order a Gift Basket from your Company last week. The ordering process was quick and easy. The best part was the feedback we received from the recipient who was happy with the presentation and freshness of the bakery goods. Thank you, will order again! I purchased a tower for my elderly father who loves sweets and refuses gifts. This one he did not refuse! Everyone in the family agreed that these were the best cookies they had ever tasted. And my father.....he's now looking forward to more birthdays!! I sent a selection of biscuits (cookies!) from the UK to a customer in US as I was late with a project. Now they still love me. Thanks Gourmet Gift Baskets! Easy transatlantic apology-sending = excellent. They said they were very tasty, or to quote "Oh my goodness, they were awesome!" so there you go. I sent the tiered baked goods to my friend as a 'thank you' gift and it was worth every dollar! She and her family enjoyed the brownies & cookies & it was delivered the next day!!! I was so happy I found Gourmetgiftbaskets.com---I won't be shopping anywhere else for edible gifts now. Sent this as a get well surprise for a relative. Arrived on time, and according to her was delicious and fun! Lifted her spirits. I sent this to my husband at work for our anniversary. He loved it. Have never had any complaints from anyone that has received a Gourmet gift from us. In fact everyone loves them. I bought this as a thankyou and Christmas gift for my fellow employees and it went over exceptionally well (especially the moon pies)! I SENT TO MY BEST FRIEND FOR HER 50TH BDAY. SHE WAS EXTREMELY HAPPY WITH THE QUALITY AND FRESHNESS OF THE PRODUCT. I SENT IT TO HER AT WORK SO SHE REUSED THE BOXES AS STORAGE ON HER DESK AND LOOKS GREAT. SINCE SHE IS MY BEST FRIEND, SHE WOULD NOT HESITATE TO TELL ME THE TRUTH SO THAT IN THE FUTURE IF I WANTED TO SEND IT TO SOMEONE ELSE I WOULD FEEL CONFIDENT. YOU NEVER WANT TO SEND SOMETHING AND HAVE IT LOOK CHEAP. I ordered this as a little thank you gift for my grandmother. She is so hard to shop for but loves sweet treats and this was perfect for her! I found you guys via a google search and my grandmother was SO excited when she got this in the mail. She couldn't say enough about not only how delicious everything was but also loved the packaging. Great job guys I will absolutely be ordering again. I got this for my mother and she LOVED it. Best present for mothers day. 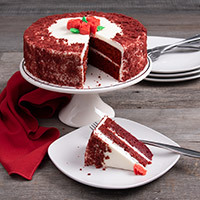 I could not believe the compliments i heard about the plain cheesecake i ordered for my mother and grandmother for Valentine's Day. It even arrived on the exact day that was indicated. 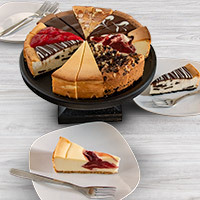 One of their family friends tried a peice, and she said it was the best cheesecake they had EVER eaten... they all almost fought over the last peice! so her, along with my mother and grandmother, all wanted the website info so they could order some more of that cheesecake, because they were borderline heart broken when it ran out ha... definitely looking forward to my next orders from you all! Ordered this for my brother's birthday. We live in different states, so I never saw it or got to sample, but he said it was very good, especially the brownies. Everyone really enjoyed the desserts and said they were very good. The service was fast easy and on time. Thanks will use again!